Shooting Review: Sig Sauer P320 Carry | Eagle Gun Range Inc. Since I have for some time had my carry weapon system locked in, I don’t spend much effort trying to find the next pistol I want to buy. But once in a while a worthwhile innovation makes me sit up, take notice, and contemplate reconsidering my carry platform. The Sig P320 is one of these and I’ve been waiting with great anticipation to get my hands on a model other than the full size to try out. Recently I’ve been shooting the P320 Carry model chambered in 9mm, which is the compact slide with the full-size grip. While shooting it presents some fundamental challenges to my ingrained habits, I’m finding the experience to be compelling. 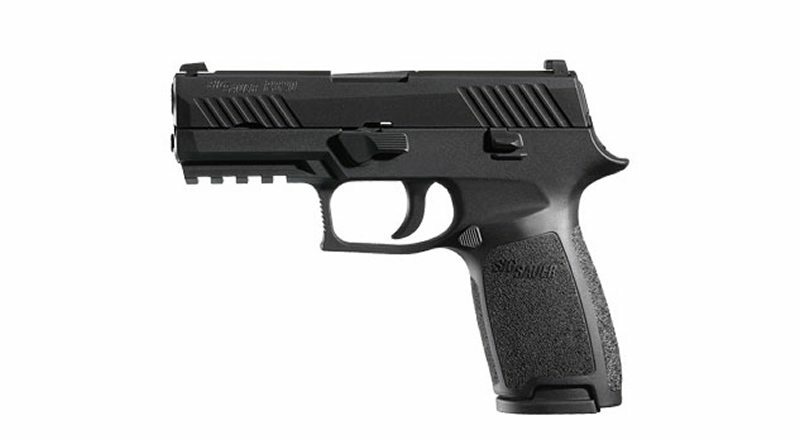 Especially given some of the features this newish Sig Sauer pistol offers. Here are my thoughts on the Sig P320 Carry model after putting a few hundred rounds through it this month. Why Consider the Sig P320 Carry? The P320 Carry and compact models are purpose-made concealed-carry pistols. The relatively short length of the slide means that they’ll work for any standard position for IWB carry: 3-5 o’clock or appendix position. Unlike most of Sig Sauer’s pistol line, the P320 is striker fired. In keeping with good sense for a carry gun, it has no external safety or any other superfluous external controls. Yet another reason to consider the P320 Compact or Carry is its modular chassis system. 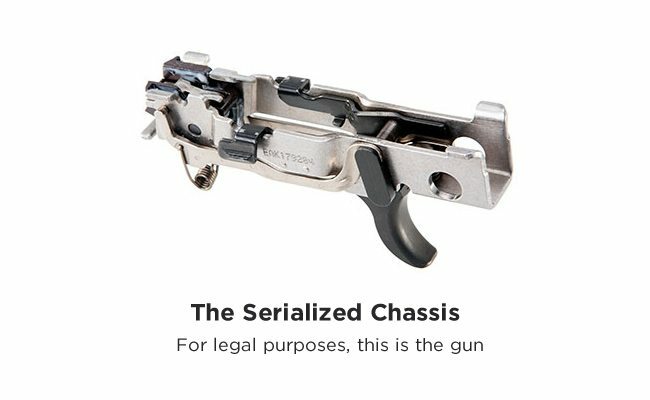 The serialized component is not the frame lower, but the chassis that rides inside of the un-serialized frame. 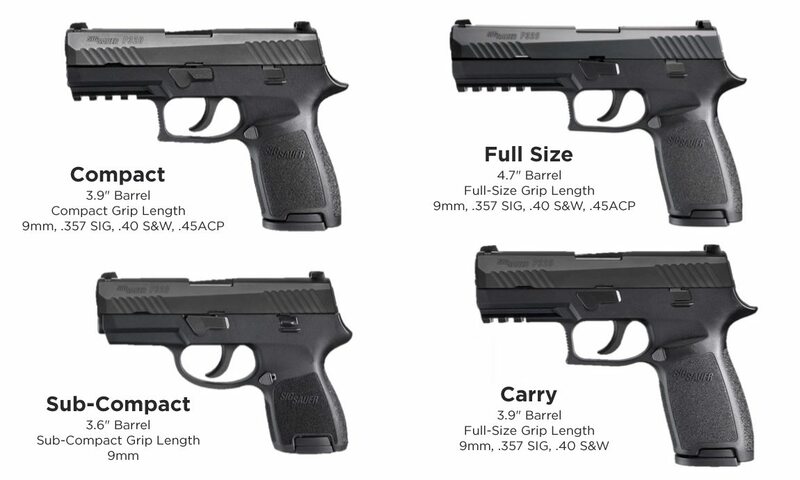 This means that you can swap out frames to fit your hand size (sm, md, lg)—even going from full-size to subcompact—and even changing from 9mm to Sig .357 to .40 to .45ACP without changing from one serialized gun to another. I think this is a wonderful system for a modern firearm. For the purpose of this review I shot the Carry model 9mm, which has the compact slide and the full-size grip. It’s all but identical to the compact model (only 2/10” difference in overall height). The Carry model does, however, get 2 extra rounds in the magazine as compared to the compact model. The first thing I noticed is that although the P320 is a striker-fired gun, it is configured like a hammer-fired pistol, with the beavertail and high bore axis. Given this configuration, I was worried that it would display undue muzzle flip while shooting. I found that while there is more muzzle flip than say on a similarly sized Glock 19, with its low bore axis, the P320 wasn’t so bad. The most significant difference here from what I’m used to shooting is that the grip angle on the P320 is more vertical than that on a Glock. It’s the typical Sig grip angle, similar to a 1911. This meant that my well-drilled point of aim had the muzzle pointing below proper position and it took me a few shots to remember to adjust so that my press-out placed the sights in proper alignment. Once I did, though, shooting the P320 was a nice experience, especially due to the excellent trigger. The grip of the P320 is rather substantial. It feels a little fat because it is more rounded on the sides than most grips. Even with the full-feeling grip, my medium-sized hand has no trouble getting a good position on the trigger. I found it to be quite comfortable. Of course if you don’t like the grip size, you can always change the frame for a larger or smaller one, at minimal expense. There is a bit more muzzle flip than I find on most striker-fired pistols, but by resting my support-hand thumb forward on the takedown lever I found it easy to control the recoil. I had no trouble shooting strings of several shots in quick succession and at multiple targets, so there are no control issues with this gun. With 17-round magazines for the carry model and 15-rounders for the compact, the capacity is right in line with what I’d expect. Interesting to note that the carry model grip is only 2/10” taller than the compact model, but you get 2 extra rounds in the mag. The trigger on the P320 is without a doubt the best I’ve felt on any polymer, striker-fired pistol. If I could get this sort of feel and action into my pistols, I’d do it in a heartbeat. I’m guessing some folks will enjoy the absence of a trigger-safety sticking out from the shoe, giving the trigger a more comfortable marriage with your finger pad. The frame of the Sig P320 is kind of awesome. 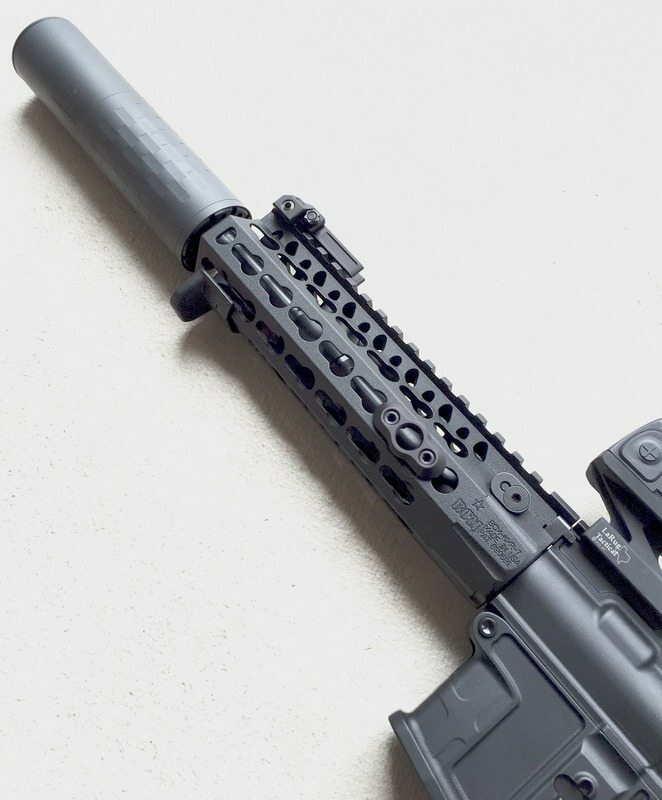 Because of the modular chassis, you can change out frames for grip size, color, model size, and even chambering without changing (serialized) guns. Frames are available for about $46 in three colors: black, flat dark earth, and OD green; and each is available in small, medium, and large sizes to fit your preferred grip size. For an armorer/tinker like me this is a wonderful and compelling innovation. More stuff to play around with! I note that the frame texture is quite mild, so like all other polymer pistols it’ll be useless if your hands are sweaty or bloody. Stippling is required. The sights are iron, 3-dot night sights and the rear sight has a nice flat front face for easy purchase in one-handed slide racking. I found them easy enough to pick up visually when firing and transitioning to different targets. The magazines are steel, with polymer base plates, and very nicely constructed. They drop free when ejected. They’re exchangeable between the P320 and the P250 of the same caliber and size. Unlike some steel mags, these don’t terribly abrade your thumb when charging rounds into them. The external controls on the pistol seem well positioned to me and the magazine release is reversible. The slide has serrations fore and aft and interesting contours and the frame’s picatinny rail allows for a flashlight or laser. I like the fact that the bottom of the grip has a cutout for better purchase on the magazine base plate; useful for those malfunctions where the mag tends to stick. Though this is just a shooting review and I did not field strip the pistol, the P320 has an easy and safe disassembly. Rotation of the takedown lever allows disassembly without tools or trigger manipulation, which brings an added level of safety for careless people. Internals include a striker safety and disconnect safety. 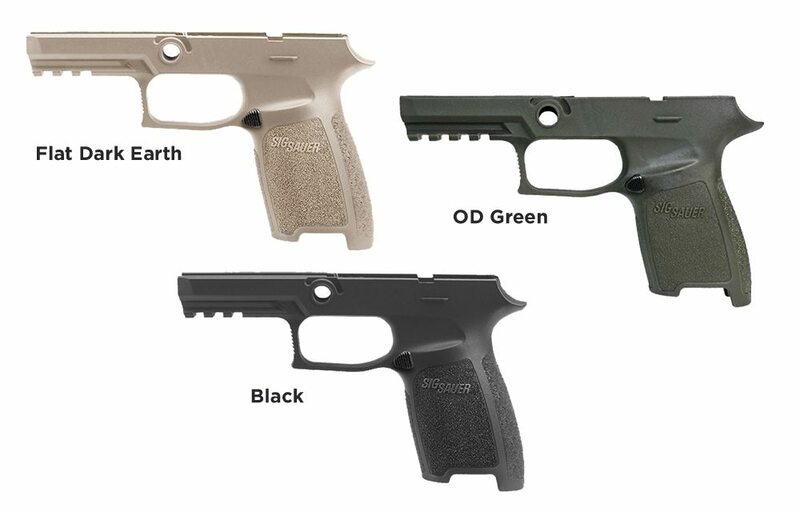 The P320’s frame can be swapped for color or just the right fit, and even from compact to full-size and different calibers. The trigger is as good as it gets for a polymer, striker pistol. The components are just right out of the box and the must-haves and must-not-haves are good to go here. You get two magazines with the pistol. For me, it’s the only pistol I’ve encountered that could tempt me away from my current everyday-carry system. As a carry gun, the P320 is a bit wider than you may like. For comparison, while a Glock runs 1.18” in width the P320 is a bit wider at 1.4”, which may impact how you choose to carry it. The hammer-fired-like profile of this striker-fired pistol gives it quite a high bore axis, adding to the felt recoil and muzzle flip. Using the takedown lever as a thumb rest for recoil management works, but is perhaps not the most comfortable proposition when shooting hundreds of rounds in one session (my already calloused thumb was rubbed pretty raw). With the multi-size and comfortable frames, the only knock against the ergonomics is the high bore axis and different (for me) grip angle. This grip angle will be familiar for many folks. Shoots great! Only the slight addition of muzzle flip due to the bore axis counts against it. I found nothing to complain about with its accuracy. I note that I had to use a 6 o’clock hold for 25-yard shots. The P320 Carry will not be as concealable as would the compact model, due to the slightly longer grip. Also, at 1.4” wide the P320 is not the slimmest carry gun you’ll encounter. The sum of the positives here is compelling and could one day tempt me away from my almost exclusive dedication to Glocks as my carry guns. The chassis system is fantastic and makes me wonder if other manufacturers will try it out. If you’re a striker-fired enthusiast, the Sig P320 is one pistol you simply have to check out and evaluate…for all of its many virtues. Rent this gun and give it a try (I note that Eagle Gun Range has a full-size and Carry model in their rental case). I bet you’ll be impressed on several levels. Great review Andy! I’ve had a P320 Carry on order for almost 7 months, the distributor says the carry model has been out of production most of last year. Hard to understand, cause of the modularity , the only difference is the grip module. I ordered a 9 mm, FDE. Do you have any info on Sig production problems? Thanks John. Sorry to hear you’re having an unpleasant wait. I’ve heard no news of production problems at Sig Sauer. There are lots of folks who have them in stock right now. If you’ve not paid, you might at least check out Gun Broker. You could have yours next week! I just got a sig. p320 carry in 9mm, accurate & handles nice. But the trigger is horrible, it is very spongy (not crisp at all), not a short pull. I don’t mind the 7 pound pull, but way too spongy. Very disappointed! Not at all like the ones I tried in the gun stores. Personally I don’t don’t feel any additional muzzle flip compared to my other striker pistols. This is the nicest shooting pistol in my collection. YMMV of course. Well, no. Trigger is not as good as a Walther PPQ, it’s good but not a good as a Canick’s either. Accuracy, very good! Ergonomics, it’s as ergonomic as my Ryobi cordless drill. My duty piece in 40. Controllable but not as good as a M&P. Good gun, not great and over hyped. I just purchased the P320 carry and agree with your assessment except for the muzzle flip part. I agree definitely high bore axis but the trigger on this thing is so different from what I’ve shot that I didn’t even notice muzzle flip and was able to require several targets or repeatedly fire at the same target with relative ease (25 yards). I humbly submit this weapon also has next to zero snap (9mm). Very smooth. Very pleased with this purchase. Has anyone shooting a P320 Carry experienced too much pressure on the slide when full. Sig says it is normal for the slide to be very hard to slide back to chamber the gun. However, at times it’s nearly impossible to chamber. Is there an FDE frame available for the carry model? I think Google is your friend. Nice write up, I just traded my Kahr .45 acp for a Sig Sauer compact .45 acp went to the range and was blown away( sorry for the pun) with the handleability of the Sig. I highly recommend it. Thank you for the detailed reviews. I have read your reviews on the P320, G19 Gen 4, and G19 Gen 5. I have been able to rent the P320 and G19 Gen 4. When I shot both I liked the trigger and ergonomics of the P320 better and feel like I shot it better compared to the G19. However, since I am a brand new shooter (this will be my first handgun purchase) I feel like I can learn to shoot whichever handgun I end up getting – which do you feel like would be best? If I end up with the Glock 19 will swapping out the stock trigger connector have a negative effect on the overall reliability? How about the sights? I have heard some strongly recommend to keep your carry Glock “stock” as some upgrades can cause failures. In your reviews you do not seem to think that it is an issue, but I wanted to double check. Sorry for the basic questions, and thanks again for the reviews! P320 or Glock 19? This will be my first handgun. I’ve rented and shot both and read both of your reviews and it’s hard to decide. I liked shooting the P320 – both the ergonomics and the trigger – better than the G19. However, as a new shooter I feel like I can learn whatever system I start with. In your opinion, would it be wiser to start with the P320 or G19? Hi. I bought mine October 13 and l haven’t slept well ever since shooting it that same day. The trigger took some getting use to, but it’s nice and I love it! I’m going back to the range today to put the ol’ booger hook on the bang-switch again. It’s one heckuva shooter!